What should you know about me? I come from a long line of unsmiling—eh, stoic?–laborers from the Far East and Southeast Asia: farmers, a beekeeper, even some accountants–those count, right? They do monotonous work year after year, with few highs and many lows. That should have prepared me for something more than Calculus. When my supervisor compared my help during a summer internship to my doing a yeoman’s job, I couldn’t help but feel understood. He got me. My people are a patient lot, equipped for consistent, methodical work. 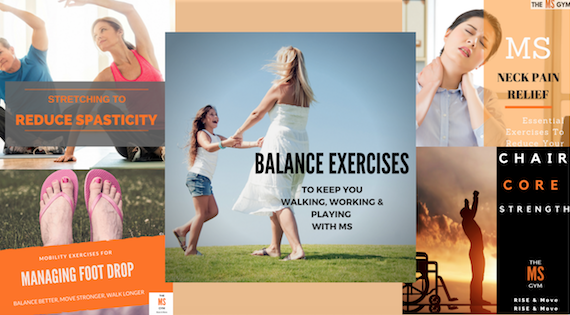 So perhaps it’s no surprise that I am in my happy place doing my core program and at least three companion guides each day, week in and week out, since first finding the MS Gym May of 2018. Give me an endless task: I’m on it! I can outdo that Sisyphus in boulder pushing any day. Well, not quite. Despite my resolute roots, I get impatient like anyone else. I see the successes others are having and wonder, why haven’t I achieved that yet? Aren’t I devoted enough to my exercises? Aren’t I attentive enough to my form? Why can’t my hip flexor do that yet? Is that even physically possible? Last summer, I thought I could hasten the healing process and do two cores a day and then wondered, why am I so tired? Why do I feel an overwhelming need to nap when I’m not a napper by nature? Jodi Feltham set me straight on that: Don’t overwhelm the brain. Stick to one core a day. Late autumn, I thought, let’s take advantage of the fact I have limited sensation in my limbs! I can do stretches even if I have a hunch I’m probably going too far too quickly and not hearing the shriek of my muscles. I’m not in pain: I’ve got this! Not so much. An overeager cheerleader stretch I saw in a Movement Detox produced black and blue bruises all over my weak leg, along my adductors and hamstring. When it began throbbing and I became feverish and new bruises cropped up without any additional exertion, I found myself in the ER. It took me two months to recover from that bout of overeager stretching, during which time I could hardly sit up or stand on my own or answer the door, all things I had begun to take for granted in the past several years, as I got stronger. OK, I’m still technically recovering, but the mishap reinforced a lesson I needed as I saw others zoom ahead of me in their core programs. There are no quick fixes as we rebuild our bodies. In a world of on-demand and of same-day delivery, there is no instant gratification in managing MS. There is just the deep confidence in knowing we have the tools to improve and are on the right track if we trust the process. This sounds cliché even to me, and I believe in the program. You know what keeps me patient when I experience a setback, whether induced by stupidity, impatience or the mysterious workings of my immune system? I think back on all I’ve gone through since I got MS and it gives me a great sense of calm. What? What am I talking about? Well, aside from being the progeny of peasants, I have a long history with MS. I’m 37 now, but have had MS for at least 23 years, when I had my first major attack and the right side of my body went kaput. So I can look back on all that history and see how long it took me to make the progress I am benefitting from now. It took me over fourteen years from this first major MS episode to realize I couldn’t just ignore my body. (I was a person of the mind, wasn’t I? What did I need to worry about my body’s not working?) It took me another nine years before finding a workout routine that helped me systematically get stronger instead of just draining my energy for the day (yup, the MS Gym). Before then, it was just trial and a lot of error. I started getting daily bladder accidents at age fifteen. It took another fifteen years to wean myself off the largest pads available and trust myself enough not to have accidents. I’m still working on strengthening my pelvic floor, so I can walk further without worrying about having an accident (still a concern, as now I don’t have a pad to absorb what leaks may come and am showing my backside more by venturing to walk outdoors), but if I can put up with navigating high school, college and the dating world in a mega-pad and the unmistakable stench of urine, I can do this. It took me thirteen years to leave my block on my own after I started using a wheelchair at the age of 23. It was only earlier last year that I began to be able to open doors on my own and propel myself up over door thresholds and up most curb cuts. So last summer, when I found myself again stuck in my living room, dreading even going into my bedroom or the bathroom due to the oppressive humidity, others had no idea my life had become so circumscribed again: I was too immersed in my workouts and making friends in the MOC to get cabin fever. And my newfound freedom was waiting for me when the humidity ended. It took me seventeen years to get off antidepressants. Even if I get into a dark mood some evenings or experience a panic attack, as my partner and close friends know, I can make it through to the other side and don’t worry any longer about being a burden on society, my default fear all those years prior to joining the MOC. It took me six disease modifying therapies and almost two decades to find a DMT that stopped my getting relapses that affected my gait (my eyes are another story). Some would say they’d failed these prior medications. I’d like to think I traded up each time (no offense, Avonex). I might still get such relapses in the future, but I have the tools now to reduce inflammation and repair my gait through movement meds (woot!) and no longer even think of myself as having a progressive condition, though I had an aggressive form of SPMS for two decades. I still slip up and my impatience shows. I still catch myself frustrated with my body sometimes, especially when I see others making progress in leaps and bounds. But I remind myself that none of us are battling the same lesions, disease history, or circumstances. And I reflect on everything I’ve been through and remember I should feel proud I’m working to repair such old damage. Just a few years ago, I was preparing to use a wheelchair full-time. I didn’t even think it was possible to halt the progression of my disability, much less reverse the disability I’d had for so long. As I’ve told others, everything from here is a bonus: Bonus steps! Bonus muscles! Bonus milestones! Wait, am I allowed to be this excited? Or am I meant to be dour, like my ancestors (um, my parents)? What goals of yours are worth your patience and perseverance? How can you use your perspective on past challenges to your advantage?